New generation projector with Bluetooth function, so, use for what? 2: Connect with your Bluetooth speakers or bluetooth earphones to projector's sound, Enter a new world of superior sound. -1GB RAM & 8GB ROM Internal Storage, support 32GB USB flash drive and 1TB mobile hard disk drive. -25 level zoom function is to adjust screen size to suit your projected area. - ±15°keystone correction,keeps your image in rectangle without tilt. √ Our Network Assist technology keeps your 【WiFi connection】 more fast and smooth. Bult in android system enables you download Apps and watch online movies.Replace your wired MHL cable connection by our no buffering quick android system to achieve wireless screen sharing with your tablets: phone, iPhone, pc, laptop, Mac. 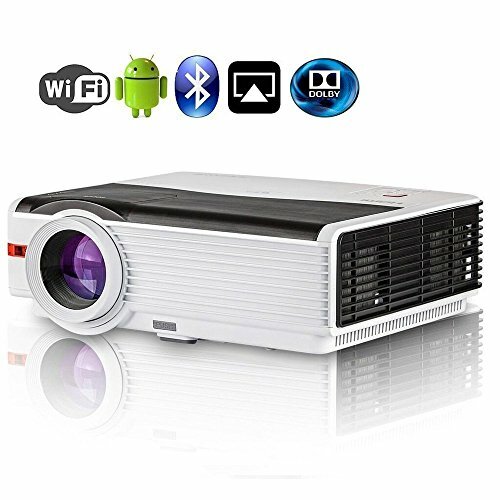 √ High Definition Projector, big image in short distance: 4200 Lumens, Native Resolution:1280x800(support 720p/1080p),Contrast Ratio: 5000:1, Projection Distance: 6.56-19.68FT, Projection Size: 50-200 inch. Aspect Ratio: 16:9 /4:3. Magical Wide Angle Lens- Project large screen size in relatively short distance. √ Range of use: TV replacement, good for tv, movie, gaming, backyard night party, sport event viewing, compatible with Google store, TV box, XBOX, Blue ray player, DVD player, wii, Sony PsP3, DVR etc . 60HZ high refresh rate without hysteresis,ensure you more smooth and excited gaming experience.